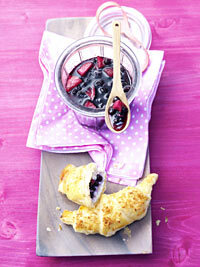 For marmalade: Stir together the frozen wild blueberries and jam in a small saucepan. Quarter, peel, and core the apple, then cut into small pieces. Add apples, cinnamon and nutmeg to the wild blueberries mixture. Cook about 5 min until apple is cooked slightly. For croissants: Defrost flaky pastry and cut it into halves diagonally. Stir together cream cheese and coconut flakes. Put one dollop of cream cheese and one large dollop of Wild Blueberry Apple Marmalade on the pastry, brush edges with water and roll up pastry to croissants. Pre-heat oven to 425 F (225 C). Cover baking tray with parchment paper and place the croissants on tray. Whisk milk and egg yolk and brush the croissants with the mixture. Sprinkle croissants with the remaining coconut flakes and bake them for approximately 10-12 minutes. Preparation time for Wild Blueberry Apple Marmalade: approx. 10 min. Preparation time for Croissants: approx. 40 min.